The filter() function is used to subset the rows in a data.frame. The first argument is the tibble data (or data frame). The subsequent arguments are logical expressions that refer to variables within the data.frame, selecting rows where the logicals are TRUE. filter() Extract rows that meet logical criteria. ends_with() Select columns whose name ends with a character string. matches() Select columns whose name matches a regular expression. num_range() Select columns named x1, x2, x3, x4, x5. one_of() Select columns whose names are in a group of names. starts_with() Select columns whose name starts with a character string. In the next example, the dataset is split into individual planes and for each plane a set of summary stats is calculated, including the number of flights, the average distance traveled and the observed arrival delay. Results are filtered to focus on planes with at least 20 flights and traveling less than 2,000 miles. 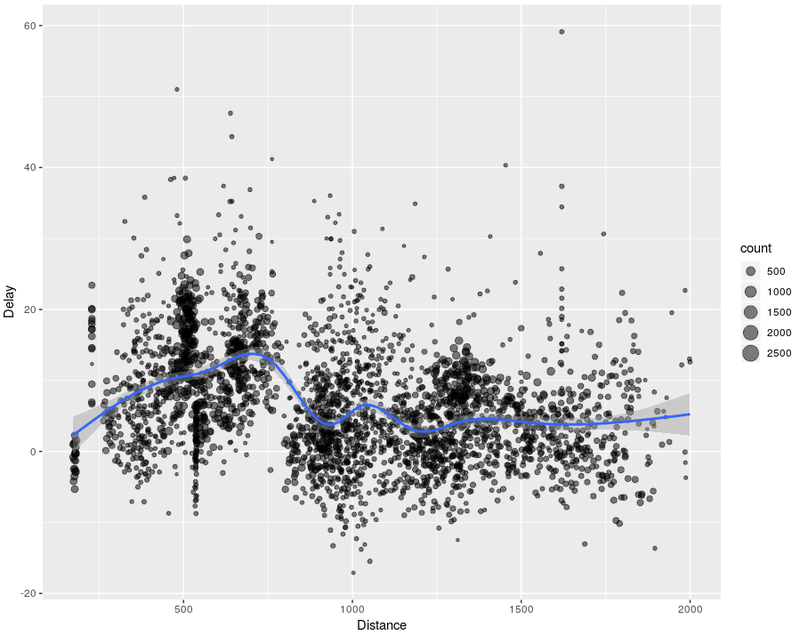 The output covers almost 3,000 airplanes and is presented in a plot using the ggplot2 package. It is often necessary to add new columns that are functions of existing columns. This is the job of the mutate() function. 1 11 2 9 1400 227 370. 2 20 4 16 1416 227 374. 3 33 2 31 1089 160 408. 4 -18 -1 -17 1576 183 517. 5 -25 -6 -19 762 116 394. 6 12 -4 16 719 150 288. 7 19 -5 24 1065 158 404. 8 -14 -3 -11 229 53 259. 9 -8 -3 -5 944 140 405. 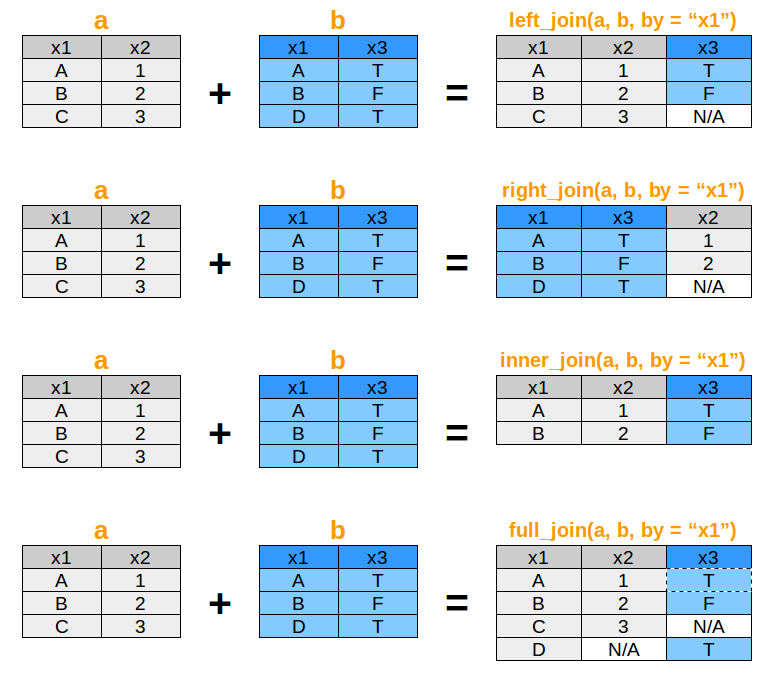 10 8 -2 10 733 138 319.
left_join(): return all rows from x, and all columns from a and b, as shown in the diagram below. Rows in a with no match in b will have NA values in the new columns. If there are multiple matches between a and b, all the matches are returned. right_join(): return all rows from b, and all columns from a and b. Rows in b with no match in a will have NA values in the new columns. If there are multiple matches between a and b, all matches are returned. inner_join(): return all rows from a where there are matching values in b, and all columns from a and b. If there are multiple matches between a and b, all matches are returned. full_join(): return all rows and all columns from both a and b. Where there are not matching values, returns NA for the one missing. semi_join(): return all rows from a where there are matching values in b, keeping just columns from a, as shown below. A semi join differs from an inner join because an inner join will return one row of a for each matching row of b, where a semi join will never duplicate rows of a.
anti_join(): return all rows from a where there are not matching values in b, keeping just columns from a.